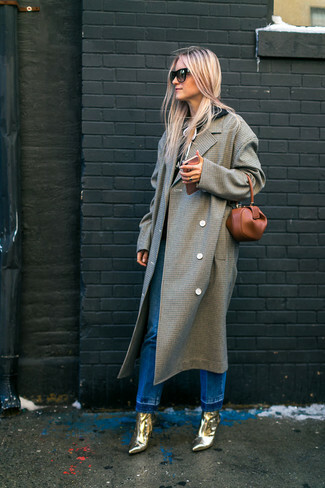 If you're scouting for a casual yet chic look, try pairing a grey coat with blue jeans. These pieces are very comfy and look stunning when worn together. When it comes to shoes, this outfit pairs really well with Salvatore Ferragamo Wave Heel Ankle Boots. If you're looking for a casual yet incredibly stylish outfit, reach for a grey check coat and blue jeans. As well as very comfy, both of these pieces look great when worn together. Spruce up your ensemble with Salvatore Ferragamo Wave Heel Ankle Boots. If you're looking for a casual yet incredibly stylish look, try teaming a light blue denim short sleeve button down shirt with navy ripped skinny jeans. As well as very comfy, both of these items look incredible when worn together. 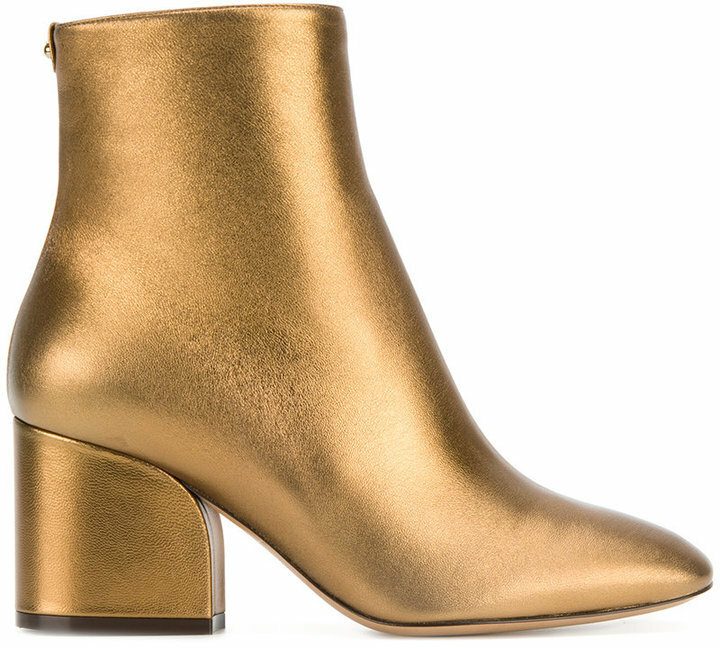 Gold ankle boots will instantly smarten up even the laziest of looks. If you're on the hunt for a casual yet absolutely stylish look, pair a beige coat with light blue ripped jeans. As well as super comfy, these two garments look fabulous when paired together. Kick up the cool of your look by wearing Salvatore Ferragamo gold ankle boots. If you're on the lookout for a casual yet absolutely chic ensemble, opt for a black pea coat and black leather skinny pants. As well as very comfy, these pieces look great together. When it comes to footwear, this getup is finished off wonderfully with Salvatore Ferragamo Wave Heel Ankle Boots. If you're hunting for a casual yet absolutely chic look, team a beige leopard fur coat with black leather skinny jeans. As well as super comfortable, these items look incredible paired together. When it comes to footwear, this ensemble is finished off nicely with gold ankle boots. Make a brown fur jacket and black dress pants your outfit choice for a stylish and sophisticated look. When it comes to footwear, this outfit is round off nicely with Salvatore Ferragamo Wave Heel Ankle Boots from farfetch.com. 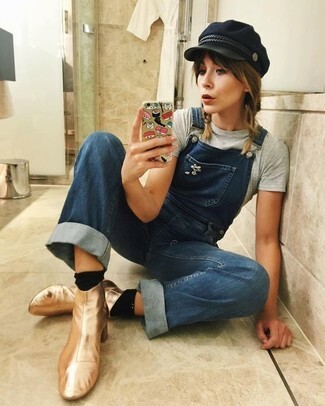 If you're a fan of functionality dressing when it comes to fashion, you'll love this totaly chic combo of a grey crew-neck t-shirt and blue denim overalls. You could perhaps get a little creative when it comes to footwear and dress up your look with Salvatore Ferragamo gold ankle boots. If you're scouting for a casual yet totaly stylish outfit, team a white fur jacket with navy skinny jeans. Both items are totally comfortable and they also look great when worn together. When it comes to footwear, this look is round off wonderfully with Salvatore Ferragamo Wave Heel Ankle Boots from farfetch.com.